Railpictures.ca - Doug Lawson Photo: An imposter. BCOL 4615 sporting new coat of CN paint. It just doesn’t look right. Anyhow, my Conductor and I wandered around the shop track looking for something red, white and blue with 4615 on the side, then we found this. | Railpictures.ca – Canadian Railway Photography – photographie ferroviaire Canadienne. Caption: An imposter. BCOL 4615 sporting new coat of CN paint. It just doesn't look right. Anyhow, my Conductor and I wandered around the shop track looking for something red, white and blue with 4615 on the side, then we found this. @hoggerdoug. Hey man, lighten up. You said it yourself. We all have different opinions about various subjects in railroading and perhaps for us lucky enough to have ran a locomotive in our jobs may have been the ultimate experience. So embrace those differences. There is no right or wrong here. Just be happy that somebody captured these units on film before they are not a part of the locomotive landscape. sorry I posted today. Everybody is entitled to their opinion although evidently I have the wrong opinion. What about the ever popular sagging frame, it’s feeling left out of this tirade. I had the pleasure of being invited up into the cab of the 4614 this summer. I’m with 4u and the rattle trap description. That cab sure seemed dirtier and more worn out than the cabs of the few 7900′s (NW2′s) still working when I hired on back in 1975. And they only had a simple bench seat on the firemans side. Well hoggerdoug lets see. I had the pleasure(as a railfan)displeasure to operate these Dofasco trucks underneath HR616′s,M630/36′s so lets say those trucks behaved exactly the same under the C40-8M’s. Yes the later Dash 8/9′s rode under GE standard trucks and had a better ride. Beg to differ about the SD40/40-2′s. In my opinion they are far superior to any of the old GE. The Draper Taper idea is a joke and a total failure in design. As the GE’s age they become old rattle traps held together by duct tape, ceiling insulation falling down, drafty windows, rattling chairs and hot plates. They may not be the newest power but the best riding and quietest units on the system are the 5600-5800 SD70/75I’s. Not sure what “ngineere4u” considers awful to operate about these units. Sure a lot better than a noisy vibrating SD-40. My favourite loco was the last batch of Dash9-44CW that BC Rail got, 4645 to 4654. In my opinion they were the ultimate loco to run and they were appealing to the eye as well. Comfortable cab, good heating in cold weather and quiet. Then again they were BC Rail pride of the fleet. @snake2 . 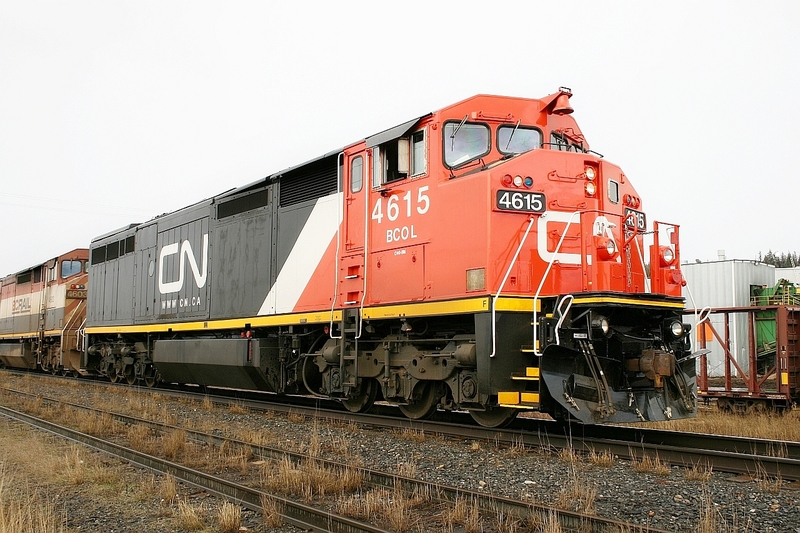 The MLW trucks and other components were part of the deal that CN made with GE. Canadian content and reusable parts.